In the study of science, it is very important to know that all solids are not the same, and all liquids, and gases are never the same. In addition to that, it is important to understand why all liquids are not the same, and why some are purer than others, in terms of their chemical make-up or compositions. This is why classification of matter is important. Matter can be classified into two categories: pure substances and mixtures. This classification is based on the internal composition of that matter. Using composition to describe matter is better than using its state, because the internal make-up makes matter unique, and not its phase or state. Example, water ( ) can be vapor, solid or the usual liquid. This means that scientifically, it is not correct to say water is a liquid, even though we all know that water is usually a liquid. In a similar vein, classifying matter only according to its color, size, or weight is not enough because two identical objects can be of the same color, but their internal make up may be different. Example, a glass of water from a lake may look and weigh the same as another identical glass of water from another lake—but it does not mean they are the same. They are all water, but the chemical compositions may be very different. 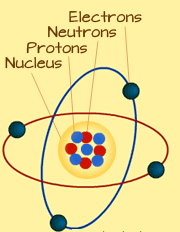 The diagram above is an illustration of an atom. The center part is the nucleus. Some atoms can also join up with other atoms of the same element. When two or more atoms join up, they form a molecule. Oxygen, ( ) is a molecule, because it has two atoms joined together. An oxygen molecule looks like those in the diagram above. It is also important to note that compounds do not necessarily look like the elements that formed it. Compounds are usually a result of a chemical reaction or bond, which means that they are entirely new materials. For example: Hydrogen and Oxygen elements are both gases, but after bonding chemically, they form water, which is liquid at room temperature. A substance is simply matter with definite chemical composition and distinct properties. It is matter that is characterized by a constant composition in terms of its molecules, formula and atoms, as well as physical properties such as density, refractive index, electric conductivity, melting point, and so on. 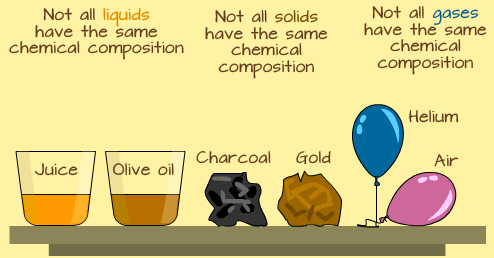 A substance can be an element or a compound but NOT a mixture. It can also be matter that exists in its pure form, usually called a pure substance. A few examples of substances include Water ( ), Hydrogen ( ) and Neon (Ne). Other examples of chemical substances commonly seen in pure form are salt (sodium chloride), diamond (carbon) and gold. The diagram above shows the classification of matter and where substances fit. Substances cannot be separated into components by physical separation techniques. Some substances, like water, can be broken down into elements by a chemical reaction (to break chemical bonds). A substance can be solid, liquid, gas, or plasma. A mixture can involve two or more substances of the same phase or different phases. For example: you can mix water and sand (liquid and solid), sugar and salt (solid and solid), water and oil (liquid and liquid) or nitrogen and oxygen (gas and gas). Clearly, mixtures can vary a lot and can be homogeneous or heterogeneous. Mixtures involve mixing substances, so let us first be clear what a homogeneous substance is. When a sample of matter has the same composition throughout, we call that substance a homogeneous substance. A cup of water will have the same chemical composition throughout ( ). That makes it a homogeneous substance. A piece of gold will also have the same chemical composition, making it a homogeneous substance. Homogeneous Mixtures behave in a similar way — the substance formed appear to have the same chemical composition. Alloys and Solutions are Homogeneous mixtures. A mixture can also result in two or more phases clearly separated by boundaries. Very often, the separation can be clearly seen by the eye. A heterogeneous mixture is one that does not have uniform properties and composition. Take a look at a bowl of cereal with nuts. A spoon full will surely have different number of nuts than a second spoonful taken at random. Another example—take some sea-sand into your palms. Look at it closely and you will notice that some sand particles are bigger than others, and the colors of some particles may be different too. They are NOT uniform in anyway!